SXM Airport Emergency Evacuation Drill Deemed a Success. The airport community and passengers vacating the SXM Airport, following the general evacuation announcement. 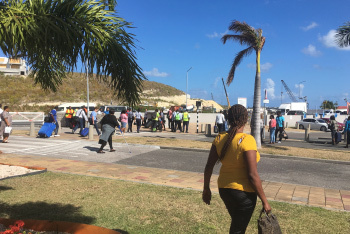 SIMPSON BAY, St. Maarten (Thursday March 28, 2019) - Following the activation of the fire alarm system, both passengers and the airport community were instructed to evacuate the Princess Juliana International Airport (SXM) via the general evacuation announcement at exactly 9:02 am on Wednesday March 27, 2019. This procedure served as part of the airport’s emergency evacuation drill exercise during which everyone successfully vacated the Terminal Building on the landside and airside. Leading the project was the Rescue and Firefighting Department (R&FF). 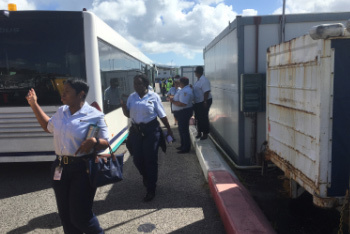 The objective of the exercise was to test the quality of SXM Airport’s Package One Evacuation Plan and to evaluate the processes during an evacuation. The exercise was successfully completed in cooperation with the Princess Juliana International Airport Emergency Preparedness Committee. Serving as evaluators were the St. Maarten Civil Aviation Authority, the Quality Assurance Department and the Chief of the Rescue and Firefighting department, Manilo Penijn. The emergency evacuation drill was called off at 9:21 am, when normal operations were restored.